A brilliant, successful criminal defense attorney's life is turned upside down when he takes on a case of a murdered woman who turns out to be an old flame who left him 10 years ago. Robeson In His Most Memorable Role!-Cast of Thousands In $500,000 Epic! John 'Johnny' Zinga: Can we have a hut? My wife is tired. 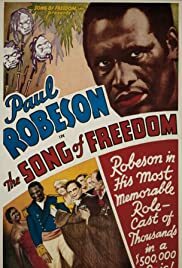 Another great Paul Robeson movie. This movie is about how sheer chance and pure luck and can lead to fame and fortune. Paul Robeson is wonderful. His singing is comparable to that in the 1936 Show Boat, arguably the greatest musical ever made by Hollywood. Paul Robeson is such a commanding presence in this movie that without him this movie could not be made. Also the story is compelling as a man has a chance to fulfill his dream and in the process learn more about himself and his roots. Anyone who gives any thought to their own roots can relate to this movie. It's about a man's quest for cultural and spiritual fulfillment which this movie mots effectively portrays. Also impressive is Elizabeth Welch who plays Mr. Robeson's wife. A good story, well acted, excellent, inspirational songs, all combined to create a great movie.